In 2013, the College of Business introduced a dedicated trading room that is used by the SIF’s student managers. For the first time in its 10-year history, a real-world investment fund managed by undergraduate and graduate finance students in the Florida State University College of Business broke the $4 million mark. The Student Investment Fund (SIF) closed Wednesday with a total value of $4,026,382. The fund is up 17 percent from the same time last year and up 10 percent year to date. The SIF started in 2008 with a $1.2 million investment from private donations and generous investments from the Florida State Foundation. In all, the foundation contributed $2 million in the base fund, an amount students were able to more than double. Several members of the foundation’s board serve as directors on the SIF board. 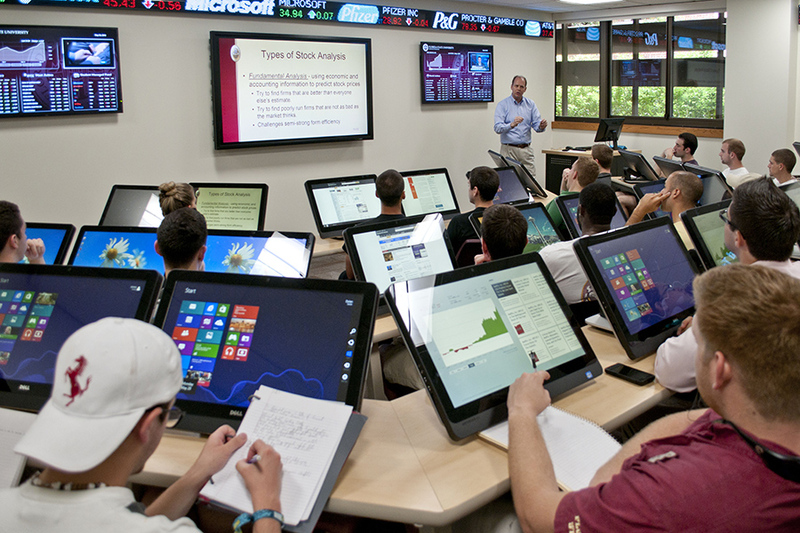 In 2013, the College of Business introduced a dedicated trading room that is used by the SIF’s student managers. The SIF was created to train finance students how to actively manage an investment portfolio. Ideally, the SIF enriches student education through active participation in financial decision-making and financial markets. Students perform security research, pitch stocks, make buy/sell decisions and develop routine reports on fund performance. The student managers are fully responsible for the day-to-day management of the portfolio, thus gaining hands-on money management experience. They learn to deal with the uncertainty inherent in the process of estimating stock value and contrasting it to stock price. The process helps them develop their financial intuition and provides an arena for practical application of investment decisions. Approximately 90 percent of the fund is equity investments, and the remainder is invested in fixed income securities or cash. These percentages often change, however, as the specific asset allocation at any given time is an active investment choice made by the fund’s student managers.